“Amhion” company congratulates our scientific consultant and one of the company founders, Doctor of Sciences, Professor, Shtilman Mikhail Isaakovich on his 80th anniversary! “Amhion” company together with Medical faculty of Otto von Guericke Magdeburg University (Germany), “Arivis” (Germany), “ToxPlus” (Greece) and “Drugs Technology” (Russia) started international project NABUCO: “Nanoparticles for Brain Use, Diagnostic and Ophthalmological Applications” organized in frames of ERANET RUS PLUS program. Our company wishes you a Happy New Year! On behalf of all employees wish you prosperity and happiness in the New Year and good health and success in all your deeds! «Amphion Research and Production Centre» LLC was founded in 2006. 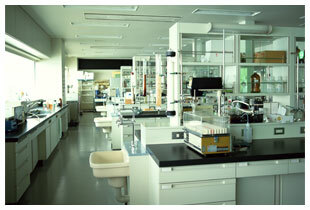 It specializes in research and development of new polymer materials for medical and biological use. 3) Creation of biologically-active polymers for various uses, including phyto-active polymers – new anti-stress solutions for crop farming. «Amphion RPC» is a fast growing company that regularly participates in various exhibitions and government contracts for development of innovative solutions for medicine, biotechnology, bioengineering, agriculture and beauty industry. All of this is made possible thanks to the «Amphion RPC» core team that includes experienced specialists, well-known for their research work in developing bio-medical products, as well as younger highly qualified professionals. "Amphion RPC" was founded by the members of staff of “Biomaterials” Academic Centre of the D. Mendeleev University of Chemical Technology of Russia. Our scientific adviser is Prof. Mikhail Shtilman, Doctor of Philosophy in Chemistry, author of more than 550 scientific works, patents and 5 monographs on biomedical polymer materials. There are 2 Doctors of Science and 6 Philosophy Doctors among our ranks. "Amphion RPC" works in close cooperation with “Biomaterials” Academic Centre of the D. Mendeleev University of Chemical Technology of Russia, which allows us to involve young university fellows, postgraduates and masters in our studies, as well as use the university’s lab equipment and facilities for the purposes of our research. Our Team has been developing new biomedical polymer materials for more than 8 years. We fully realize that creating new innovative medical, biotech, cosmetic, veterinary or agricultural products is not possible without active development of fundamental research, as well as comprehensive and thorough study of test results and theoretical basis. That is why the strategic goal of our Company, in close collaboration with both Russian and foreign leading scientific schools and research groups, is to ensure technological development and practical implementation of research results that we have, thus improving people’s health condition and standards of living. Our research team possesses the necessary equipment, qualification and experience to successfully and fruitfully work on developing new advanced biomedical materials.